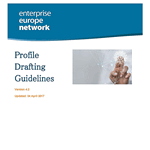 The aim of the “EEN Profile Drafting Guidelines” is to help Enterprise Europe Network partners to draft and submit profiles in the Partnering Opportunities Database (POD). These guidelines should serve as a reference document for all partners entering profiles in the POD as well as for internal, external and EASME reviewers when checking the quality of profiles before validation. To submit profiles in the Partnering Opportunities Database of the Enterprise Europe Network, please contact the EEN Belarus. The manual you can download here.